The proximity of hand position alters the processing of visual stimuli. Stimuli presented close (proximal) to hands receive an enhanced allocation of visual attention compared to stimuli presented far (distal) from hands. In the present dual-task study we studied the consequences of this preferential processing when the stimulus for Task 1 (S1) and the stimulus for Task 2 (S2) were presented together and were assigned to specific response hands (R1 and R2) located proximal (at the monitor) versus distal (in the lap) to the stimuli. In two experiments, we tested whether stimulus–hand proximity affected the extent of between-task interference (i.e., influence of additional Task 2 processing on primary Task 1 processing). In Experiment 1, results showed that stimulus–hand proximity reduced the amount of between-task interference compared to the distal stimulus–hand condition. Extending these findings, in Experiment 2 a further reduction of between-task interference was obtained when a single hand was located at the monitor instead of two hands. These results are inconsistent with the assumption of a generally increased attentional processing benefit for multiple stimuli within hand space. Instead, these findings speak for a hand-specific processing benefit that supports more separate processing of two tasks. 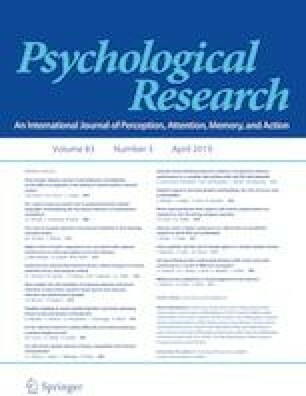 Together these findings demonstrate that stimulus–hand proximity affects the quality of multiple task performance, which is discussed in the context of both, basic and applied cognitive research. Rico Fischer and Roman Liepelt contributed equally to this work. We thank Robert Görsch, Sophia Hammer, and Isabelle Althaus for assistance in data collection and Kimberly Halvorson for valuable comments on an earlier version of this manuscript. This research was supported by grants within the Priority Program SPP 1772 from the German Research Foundation (Deutsche Forschungsgemeinschaft, DFG) grant no FI 1624/3-1 and LI 2115/2-1 awarded to both authors. This study was funded by grants within the Priority Program, SPP 1772 from the German Research Foundation (Deutsche Forschungsgemeinschaft, DFG), grant no FI 1624/3-1 awarded to R.F. and LI 2115/2-1 awarded to R.L.